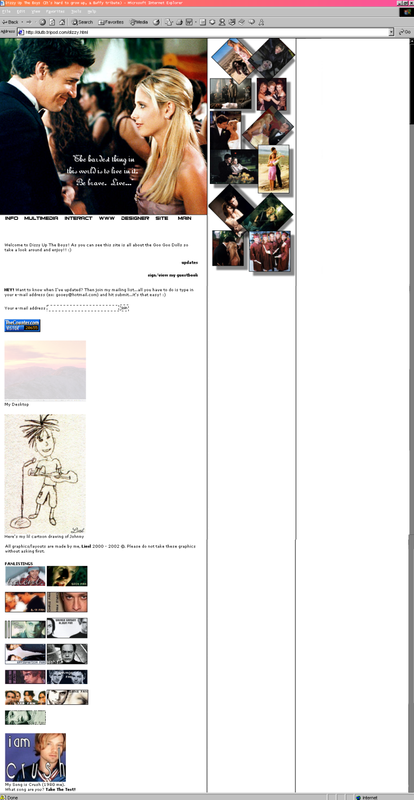 My very first site layout...version 1.0. I was trying to make the layout simple and easy to use for Goo fans. I used the red font to match the color of John's lips and used a frosty background so that the text would be a little easier to read. I am very proud of this layout...it was my first real success with graphics, html and frames. This debuted July 14, 2000. In version 2 I used a black and white picture and still kept the red font the same. I wanted to show all three "gooey" guys using a video still of them, not to mention that I loved the song and video "Name." For version 3 I again used the same color font but changed the background. In the background I incorporated a picture of Autumn leaves (since fall was right around the corner) and a picture of Johnny from the slide video...hence the title of version 3, slide into fall. Version 4 was a little different from the first three layouts. I used a solid light blue color for the background with a picture of all three guys on the left side. On the top I had a picture of Johnny with the words "I wanna bullet proof your soul, would you like to loose control?" repeating. I love that song soooo much and especially the part where Johnny sings those lyrics. This layout had more of a cool blue theme to it and I had gotten the idea for a top picture from an *NSYNC site. This is one of my favorite layouts. For version 5 I wanted to use a Christmas theme since it was December. I decided a green background with a close up of Johnny would do just fine. I also added little sparkles all over the background to make it feel like Christmas lights were shining on Johnny and the background. I also like this layout because the pic of Johnny is so clear and I must say he looks pretty good as well! Screen capture not available for version 6. In version 7 I used black and white as my main colors and added a frosty swirl in the picture of the guys. I also pixeled the sides of the layout to make it look a bit fancier and more "computerized." I decided to get rid of the old navigation system of just links on the side and instead added a navigation bar which helped make it look more organized. For version 8 I chose a bright pink color because it was around spring time so I wanted something cheerful. I picked a group photo of the guys just chillin' and layered on the pink background so that most of the color from the photo would be dissolved, making the color pink stand out. I added a starburst at the bottom of their feet and created a frosty swirl in the background where the text would lie. I changed the font color to white so people would be able to read the text and I moved the navigation bar from the bottom left to the bottom right and changed the color from red to black. I also got the name Dizzy Rockstars from an old *NSYNC site not to mention the fact that the Goo's do have a song "Dizzy" and they are "Rockstars." Version 9 is my second favorite layout. I created a rainbow color of yellow, magenta, and cyan. I tried to make the layout look like it had it's own browser window or taskbar if you will. I added a mouse cursor and moved the navigation bar from the bottom right to top right. I also chose the newest picture of the guys posing for their new CD "EOAC" and added the phrase "It's a digital feeling I've got inside." I took this phrase from a song by ATC. I really chose a computer/graphical type of theme for this layout. In version 10 I chose the colors purple and white. I wanted to advertise and support the "EOAC" CD so I added a picture of the CD cover to the layout. I also included some lyrics from their song "Two Days in February" which they were performing alot on TV shows after the CD debuted. After a couple of weeks I changed the layout again, making this version 10.5. I made a "quickie" layout in celebration of The Fourth of July. I took a promo pic from "EOAC" and layered it into a picture of some fireworks over a harbor and added the American flag colors: red, white, and blue. I also moved the navigation bar back down to the lower right hand side. I am quite pleased with how this layout came out considering the fact that I didn't spend much time making it! For version 12 I decided to go with the colors black and white yet again. I also used another promo pic from "EOAC" and blurred the lyrics "I am not to young for the world." I went back to the old system of navigation, that is just plain links instead of the navigation bar. I love the song Stop the World so I decided to make that the theme of this layout. Version 13 was definately a blue theme, winter was just around the bend so I decided to add a cold look to the layout. I took the same pic that I used in version nine and added it to the left side instead of the right and I got rid of the background in the picture so that it would be totally blue. I then used a ripple effect of that picture and added it to the right of my layout where the text would appear. I added the title "I've hit ice bottom" to the layout because I felt like I was running out of layout ideas and instead of the phrase rock bottom I wanted to use ice bottom because of the cold appearance the layout possesed. Now for a complete change of pace I decided to use tables for version 14 instead of frames. I wanted to make a sort of tribute layout to the Goo Goo Dolls for always giving back to the community and people. They are always trying to help out and it's not done to promote themselves or to sell records but rather to help aid people and places in need. For example, they contributed and still contribute to the Save The Music Foundation, and they did numerous performances to raise money for the September 11 funds. I completly renevated the site on this layout. I changed the font color, added a totally different navigation menu that would slide down or up when you would scroll down or up. This menu system was alot more organized. I also created a background image that said "Always giving" and added a top image that had pics from the NY and Washington D.C. performances benefiting the 9/11 funds and added the phrase "What more can they give?" I really feel that they have given their hearts and souls into every benefit they have performed or appeared on. In version 15 I decided to keep the layout basically the same, using the same colors scheme of pink, gray, black, and white. Instead I wanted to add a more wintery theme. I took a colored photo of the guys posing and used some picture tubes of snowflakes and clouds for the background and top picture. This layout is my third favorite layout. Another layout I am very proud of. Version 16 is dedicated to the Gutterflower CD and also to the song "All Eyes on Me" I must admit that the background I didn't make myself, I found it on a wallpaper site but I liked how the girl in the picture was looking down at the ground, almost as if she was sad. I also liked the colors and digital type of background on the left side. Once I saw this wallpaper I knew that it would make a good layout. I took the lyrics from the song "All Eyes on Me" and added them to the background and I added a yellow flower to represent the new Gutterflower CD that the guys have worked so hard on. I also added a new navigation, they are actual images that are applied to the layout background. I created a new type of scrollbar as well, making it a light yellow/white instead of the boring gray color that it usually is. Then my final touch was making the browser window "chromeless" as they call it. At the top there is the light blue title bar with a clock that will disappear as soon as the layout is loaded and a small x (close) box that will turn white when the mouse moves over it. This layout is my fourth favorite layout. This layout is about as equal to me as my first favorite layout. I made this layout in honor of the release of Gutterflower. I used two pictures, one was the Gutterflower CD cover and the other was 5 song sampler CD cover. I wanted to use the colors in the CD but I felt like they should be a bit lighter for contrast. That's when I decided to use a type of melon color. I really like the way I used the font to write Gutterflower and I even added lyrics to "Here Is Gone" in the background. I also changed the navigation and added a place where people could see my desktop (not like that really matters but I thought it would be something different to look at) and I also added a special place where Goo fans could contact me. I think this is one of my better, more creative layouts. I liked this layout, it was inspired by Darren Hayes's song, "Spin." I went with a DJ type of theme and included the lyrics to "Spin" in the layout. I also made it bright because the song was very upbeat and spring was coming. I also added a place where people could contact me via e-mail or aim. What can I say other than it's one of the worst layouts I've made. I originally had a black and white layout of the Goo's walking along a street but you could barely read the text. I had a heck of a time trying to create a better layout. I saw the pic of the Goo's standing by the car and immediately thought of the song, "Ride" by Darren Hayes...it was like I captioned what I saw in the pic. "Baby come on inside, baby get on this ride with me." I think this layout stayed up the shortest, just about a week. I wanted a change so I made a quick layout inspired by the song "Gunning Down Romance" by Savage Garden. I LOVE the performance they put on for that song, the choreography is outstanding and the big curtain reminds me of what they had during the Gutterflower tour. I used a couple of pictures of Darren Hayes dancing with one of the backup singers and included the lyrics. I really like the colors too. I had this layout up for quite awhile, probably as long as version 21. I created a 3-D image of some mountains, a lake, and the moon and added some lyrics from Savage Garden's song "To The Moon & Back." I was feeling pretty lost so I used the lyrics "It's like a journey I just don't have a map for" on my splash page. Then included the words "I would fly to the moon & back if you'll be my baby" to match the image of the mountains. I kept the colors pretty simple...light purples and dark blues. This isn't my absolute favorite layout but I do like it. I was looking for a change for version 24 so I created this layout. I used one of the Goo's promo pics and blurred and added some wind to it as well as using a hard light filter. I outlined them and took a pic using another program. I included the lyrics (You hide inside yourself and I wondered what you're thinking and everything you're chasing it seems to leave you empty) to All Eyes On Me on the layout because it really described what I was feeling and going through. The colors I chose for this layout were pink, black, and gray to match the Goo's picture. I enjoyed this layout because it was pretty simple looking. Another layout I'm proud of. I love the colors that I used especially for a winter layout! I took a pic of John singing at the Winter Jingleball and altered the image a little, making it wavy and blury. I kept the navigation pretty much the same as the last layout and used a few lyrics to Savage Garden's song, "Mine." Another favorite layout of mine. This layout was inspired by the rare bside song "I Don't Care" by Savage Garden. I had been feeling really down and well basically the song title fit how I was feeling. I used to images to create this layout. The first being a girl standing near a subway and the second was a picture of a bunch of people walking around in a train station (the second pic you can't really see as much as the first but there is part of it in the upper right hand corner and near the girl you can see some lights). I added the lyrics at the bottom of the layout and put the navigation on the upper left hand side. I was very happy with the way this layout came out! I'm quite happy with the way this layout came out. I combined to really good pics of Robby (one with him rockin' out, his hair flying everywhere and another of him during the Gutterflower promo shoot). I tried to use some different colors especially since he is such a colorful and fun person. I pixelated the border between where the pics were and the beginning of where the text would be to give it a more unique look. I also put the navigation at the top (text links). This layout came out ok, I wish it had come out a little better but oh, well. I kept it pretty much the same as the last layout only with Mike this time. My second layout in a series of four (coming soon...). I combined two promo pics and one live shot of Mike and then merged them all together. I moved the navigation from the top to the bottom and kept everything else pretty much the same. Man I LOVE this layout just about as much as my Gutterflower one! It took me over a month to plan and create this layout, I wanted it to be as close to perfect as possible seeing how May 20th was the series finale of Buffy. I included pictures from some of my favorite episodes like The Prom, Graduation, Restless, Passion, The Body, etc. I tried to make the layout resemble a scrapbook by taking the pictures and adding a background to them to make it look more 3-D. I also added one of my favorite Buffy quotes towards the bottom of the layout. I kept the color theme simple using black, white, and gray. I am extremely pleased with the way the layout came out. This wasn't the best John layout I've done but it's not that bad either in my opinion. I wanted to make it a little grungy looking. I brought out the colors that he was wearing in the layout. Basically I used some shades of brown and red and black and white. I swirled the background where he was sitting and used a wavy effect on the top and bottom corners of the image. I added one of my favorite John quotes as a finishing touch. I also decided not to use a divider between the left and right sections of my site like I had done in previous layouts. It's not one of my all time favorite layouts but it's not the worst either. I was going to try to make a real fancy layout for my final layout but then I decided "Hey, why not just try doing something simple and classy?..." So, I took a simple black and white pic of the guys near a car and just added some brush strokes to the side and pixelated the bottom. I put the navigation on the right side and used a fancy cursive font and added the lyrics to name at the bottom of the pic. I wanted to use some sort of Goo lyrics and figured that Name would be the best choice because it was that song that got me into the Goo craze...lol! All in all I'm pretty pleased with the way my final layout came out.